As most of you will know, the rugby world is getting ready for its next major competition, the Six Nations! Coaches around the world will be waiting with bated breath for new patterns, systems or game breaking plays to be uncovered by the very best players and coaches. Teams will play to certain strengths, however there are some basics that all teams will look to focus on. I believe the kicking game will be crucial to this year's competition and in this discussion we will look at how teams will use kicking to gain an advantage; GO FORWARDS – APPLY PRESSURE – and REGAIN the ball. 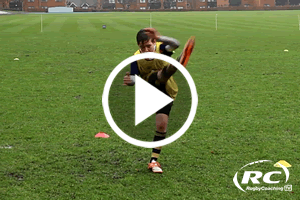 The kick has changed due to tactical appreciation, kicking is a technical activity that requires a deep understanding of not only how but also the when and why to kick. Is kicking an art or a science? Two opposing views here about the same subject – as a coach you will have your own opinion. A key tactical skill is the box kick, Ireland employ this method probably better than any other team. They use this not only through great execution but the chase and positional intelligence that turns pressure into a regain opportunity, keep an eye out for how much pressure is put on England's back three this Saturday! Ask the player to list the attributes that make the ideal player in their position. Get the player through discussion to rank the attributes by importance to the player. With younger players only have a few attributes, maybe the core skills – run – pass tackle. Once you have the attributes you want, get the player to score themselves on a scale of 1 to 10 – where 1 is the low end of the scale (needs a lot of work) and 10 is the high end of competence. Once you have this completed – you can then goal set (SMART) and set an action plan for improving the lower scoring attributes. Read up on this method – for those hoping to complete a Level 3 it is essential!